Lots of people love Oh, the Places You’ll Go! I know it’s mostly good-hearted cheer, encouragement for the journey, and wise words from a man who’d seen enough of life to know that the secret lies in looking ahead. “NO! That’s not for you! Somehow you’ll escape all that waiting and staying. Most of us spend much of our lives waiting. Waiting for a situation to change. Waiting for a relationship to heal. Waiting for health to improve. Waiting for a holiday or a homecoming. Waiting for test results, an acceptance letter, a job offer, a new opportunity, a shift in scenery or season or mood. Aren’t we all waiting somewhere in these winding lines? For crying out loud, Christians are supposed to be waiting all the time. Lest I be accused of being too harsh on Dear Seuss, I get what he’s saying. Don’t be passive. Don’t get stuck. Don’t expect life to magically improve if you’re not willing to work hard. But to be true to life’s reality, the book could just as aptly be named Oh, the Places You’ll Wait! Because we spend just as much time idling at the stop light, itching to accelerate, as we do with the wind whipping through our hair as we race ahead. Waiting isn’t an evil to be shunned, a burden to be avoided, a drain to keep us from enjoying life. Waiting is life. Around here, we’re waiting all the time now. The clock ticks painfully slowly. Each morning over breakfast, the kids ask when the baby will be here, and I shake my head at the sink, attempting to smile cheerfully while I scrub dishes. We don’t know! We just have to wait! I’m an eager and impatient person by nature. Waiting can be excruciatingly hard for me to bear. At 39 weeks pregnant, weary and waddling, I’m consumed by waiting. How I’d love to breeze past these pages of boredom and in-betweenness, of long lines and longing faces. But life never works like that. Waiting is where we grow. Where God works on us in the long and quiet dark. Waiting is work, but it’s holy work. God is here, too. For God alone my soul waits in silence, for my hope is from God. Turns out I write about waiting quite a lot. Ironically I wrote this almost exactly one year ago. I didn’t know how much of the next 12 months would be filled with waiting: waiting for a baby, waiting to heal from losing that baby, waiting for another baby, waiting to work through my fears. When impatience starts to get the better of me, when I find myself straining forward to see what’s next, when I tire of trying to live in the present, I wrestle with waiting. But wrestling never wins; it is only when I stop to catch my breath that I realize there is only This. In preparation for That, perhaps. But waiting is about the present, not the future. It’s the only way I can live right now. To parent is to wait: to watch, to witness, to wonder what comes next, to want more for your child than what they have today. But to wait is also to be forced to slow down, to relinquish the illusion of control, to put your desires on hold while life makes other plans. What could be harder than waiting? This life is a relentless pull, asking us to stop when we want to go, making us release when we want to grab tight. We have to wait in the midst of all this back and forth. We never know what’s coming; we waste our time worrying about what never happens. But when we wait – that is an act of faith. Waiting is holy time, not wasted time. Psalms sing it; Jesus spoke it; centuries of Christians believed it. So maybe the wild Technicolor imagination of the esteemed Dr. was right all along. Everyone is just waiting. But I believe that’s not half bad. Nell, I keep thinking of you whenever I am tempted to complain…I know you are much more eager/impatient than I for the big day to come! Lots of prayers coming your (and baby’s) way! Yes – the peace in the stillness. If only we could bottle it up and drink down deeply! Thank you for this – I’m still waiting, after a year of two miscarriages, to move on into something. It’s hard to see the holiness while you’re still waiting for a positive test, and an actual body on an ultrasound, while also waiting for that second due date and first miscarriage anniversary to pass by. Here’s to trying to find the holiness in waiting. Oh, Molly, waiting can be so heart-breaking, too. It is hard, hard work. God in the darkness to be sure. Sending lots of thoughts your way for your waiting heart. I was wondering if your little one had arrived yet! Prayers for the wait. And I agree with you …. I hate waiting, but some of the best graces have come to me that way. 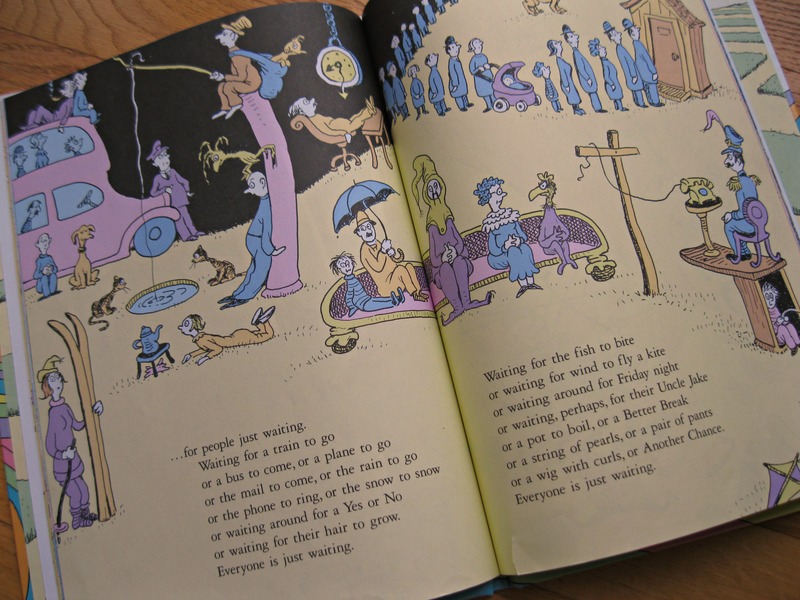 Although I agree with what you are saying about waiting be a holy time, I cannot help but to respectfully disagree about the reference to Dr. Suess. Waiting is sometimes very torturous, the purgation of body and soul to which John of the Cross accociates his “Dark Night” is a time of waiting in darkness. God allows the soul to sometimes FEEL useless as if no growth is happening whatsoever. The very next line is “No! That’s not for you” which one can take to be a very profound theological statement. John Keats said “you were not born for death, immortal bird!” Of course he meant that God did not make you to be waiting forever on earth but to be seeking Him in heaven for eternity just as in the proceeding words of Dr. Suess, “you’ll find the bright places.” I guess one can read this book in a negative or positive way, but I would like to think of it in a very positive Christian light.